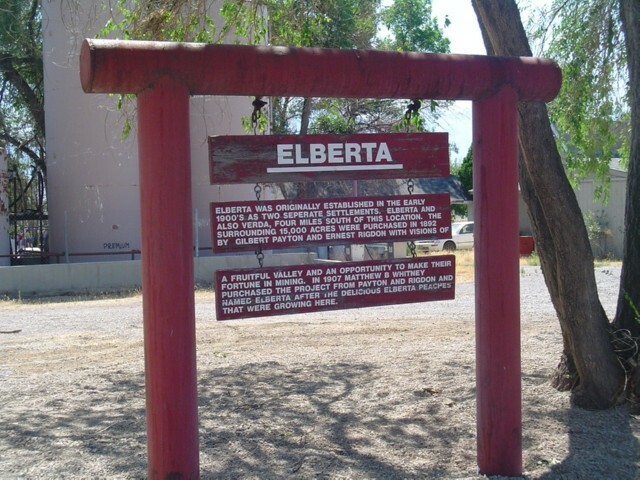 Elberta was originally established in the early 1900′s as two separate settlements Elberta and also Verda, four miles south of this location. The surrounding 15,000 acres were purchased in 1892 by Gilbert Payton and Ernest Rigdon with visions of a fruitful valley and an opportunity to make their fortune in mining. In 1907 Matthew B. Whitney purchased the project from Payton and Rigdon and named Elberta after the delicious Elberta peaches that were growing here. It was founded as “Mt. Nebo”. After the water failed in 1901 most of the early settlers moved away.